Yes, you heard that right. Google+ is breaking up. Even though by some measures it has been fairly successful, Google+ failed to dethrone Facebook as the Emperor of Social Media, and Google recently announced plans to pull out the separate features of Google+, such as Stream and Photo, and bring them to us in new ways. We can speculate about the reasons that the overall umbrella that was Google+ will be no more, and those reasons probably have something to do with the fact that Google+, despite Google’s obvious attempt to improve on Facebook by doing what Facebook does and adding some features, failed to attract all the users Google wanted it to. You only need to know that Facebook has half billion users, compared with Google+’s three hundred million, and you’ll see what I mean. Google stopped talking publicly about the number of Google+ users more than a year ago, so the writing was on the wall, even if many of us failed to read it. These changes mirror executive shakeups inside Google, as David Bresbis has departed his role as Google+ section leader and Bradley Horowitz has now assumed the lead for “Google’s Photos and Streams”. It’s interesting to note that when Horowitz announced his new position, although ironically he announced it on Google+, he didn’t even mention the term “Google+”. We all know that breaking up is hard to do. Mostly, what’s happening now is happening internally at Google. The internal dialogue at Google about what makes up Google+ is changing, and the focus on what gets pushed forward and supported is changing as well. Think of it as a continuing evolution. What does the demise of Google+ mean for business owners? 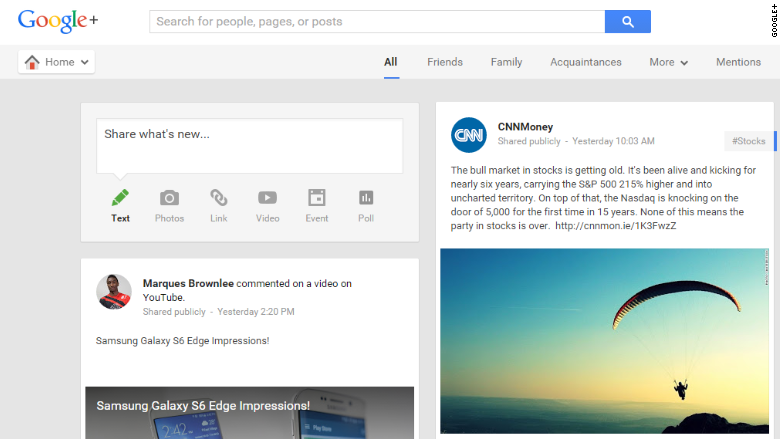 What you see on your screen when you go to Google+ still looks much the same, at least for now. If you use Gmail or have an android phone, you’re probably familiar with Hangouts because of the ease it provides with instant messaging, texting, internet phone calls, and video messaging. Hangouts most likely won’t go away, although it appears to be taking a back seat to Photos and Streams. You can read more about Google+ Hangouts here. Google+ Photos will continue to play a big role in the new iteration, as well. People love Google+ Photos because of the photo editing tools and the ways pictures are organized, allowing users to look for photos based on subject matter. For instance, you can search for pictures of kittens and end up with some pretty cute photos, like I did. See? I know. Cheap shot, right? But who doesn’t like pictures of kittens anyway? Will I lose all my Google+ followers? Probably not, as the separate features of Google+ are still available, but you may have to dance with the changes for a while. As mentioned above, Google+ users number in the hundreds of thousands, and all those people are not going to go away. If you need more evidence, remember that you can still post onto the news feed (Streams), and the photo sharing and editing tools are still up and running, too. Google is promising to take each of the separate features of the old Google+ and make each one better. We’ll all have to wait and listen, watch and see, about what this all means. These proposed changes are pretty new, and the coming days will tell much. Google has not yet said when all these changes are going to take place, or even exactly, what those changes are going to be. What should I do with my Google+ business page? It used to be that if you had a Google+ business page your SEO visibility was enhanced for Google searches, but Google changed their approach even before they announced their new plans and that is no longer the case. So one of the touted reasons for having a Google+ business page—an SEO advantage—disappeared a while ago. However, if you already have a Google+ business page, you should probably leave it there for now, continue to maintain it, and take a wait-and-see approach. You have three hundred thousand plus reasons to do so, for one thing, in all those still-loyal Google+ users. Should I create a Google+ business page if I don’t already have one? Only a couple of years ago, the advice about whether or not small-business owners should create a Google+ business page was, well of course, yeah, you should. The advantages were that the setup was fairly simple, you could reach people you might not otherwise reach, and you were able to show your business’s location via Google Maps. Those reasons still exist, mostly because there are still those three hundred thousand or so loyal Google+ users, and if you’re a serious business owner, you want to reach every person you can. If you still want to create a Google+ business page there is a great tutorial here. These recent developments at Google, though, put everything in a new light. If you haven’t already created a Google+ business page, your efforts might be better spent on creating and enhancing your Facebook business page, otherwise known as your Facebook Fan Page. Read more about creating and maintaining a Facebook Fan Page and why you would want to do that here. And if you’d like a little help with your overall social media strategy, call on MyHelpster for some fresh ideas. It’s not easy to say where these changes will leave small-business owners, but we can probably count on Google’s reputation for listening to and responding to their customers’ comments and requests. If anyone is good at getting feedback and paying attention to it, Google is. So if you’re a loyal Google+ user, while we’re all waiting to see what happens next with Google+, let them have your two-cents’ worth. In the meanwhile, keep working on your Facebook page and analyse it from time to time for better understanding of what your followers like or don’t like about you and what can you improve. Or pay attention on Twitter if you like it more. Prepare the best Twitter content strategy or read our tips for small business promotion. After you get your own free Twitter report, of course.